There are a multitude of “touring bikes” on the market. They range in price, design, quality and reliability. I know when I was first looking for a “touring bicycle,” I got a great deal of choice fatigue trying to remember all the important features of each model. I’ve got a couple bikes now that I use as “tourers,” and the preferred one is my Van Nicholas (VN) Yukon. It’s light, fast (when you want it to be), can be kitted up with panniers and fenders, and is constructed from aircraft grade Titanium – which means it’s relatively indestructible. The SRAM system on the bike is nice as well. It isn’t a classic touring bike configuration and you’ve got to retain concentration – especially late in the day, due to its not so relaxed geometry. 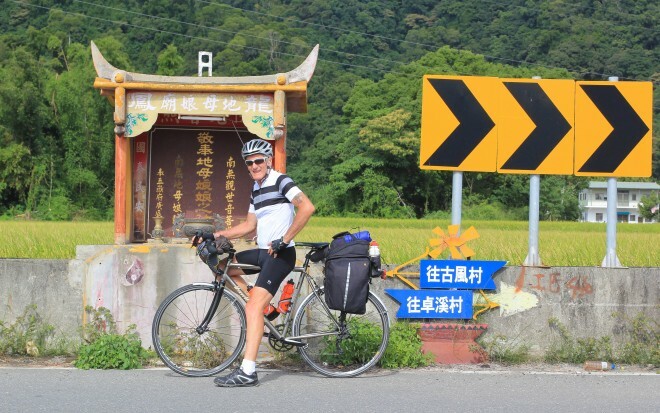 But on the tour of Taiwan that Darren and I did in 2014, the VN Yukon performed magnificently and did everything I asked of it – both on the flat ground and high in the mountains, (including a 90 km climb to Wuling Pass at 3,300 meters, and the 90 km descent down the other side). I got off the bike everyday feeling good! The Van Nicholas Yukon during our bike tour in Taiwan. This year, I’m very happy to say I’ll be touring again with my friend Darren Alff (of Bicycle Touring Pro) and this time we’ll cycling be in Portugal, Spain, France and Andorra. After that I’ll leave Darren in Spain and make my way alone to Holland. Darren will continue from Spain to Norway. When I began to think about the choice of bike to take on my tour in Europe this year, the ‘Yukon’ was the obvious first choice for me. But because of a few logistical problems in getting my Yukon from my home in Australia to Lisbon, Portugal for the start of the bike tour, I got to talking with the good folks (Ralph and Debbie) at Van Nicholas and, over some months of conversations, we came up with a plan for me to ride and road test their latest addition, the Van Nicholas ‘Deveron,’ for the duration of this summer’s bike tour! It’s a wonderful arrangement for both Van Nicholas and myself. The Deveron model pictured here is the caliper brake model, and very soon there will be a disc brake option as well. Van Nicholas tells me that they’re also working on Titanium forks for the bike in the future. What’s the Pinion system like? How does the carbon belt drive perform? Do I get off the bike every day feeling good? What’s it like in the mountains? How does it handle the descents? How does it sit on the road? How does it handle rougher terrain? Am I happy getting on it day after day? And all the hundreds of other questions which will arise. I’ll include relevant technical info as well in a future review of the bike, but the overall thrust of my testing will be how the bike works for the ordinary everyday cyclist who loves touring on a bicycle. I won’t have even seen the bike until I pick it up in Lisbon, Portugal on the 6th of May (the first day of our bike tour), so it’ll be the ‘Deveron’ and me getting to know one another for a few days! Darren Alff and Kevin Burret with their touring bicycles in Taiwan. The plan is to keep a steady flow of information coming at you about the Deveron via the Bicycle Touring Pro YouTube channel, Facebook page and Darren’s website here at www.bicycletouringpro.com – plus whatever forums we can find to tap into. I’ll evaluate the ‘Deveron’ from every point of view that we can come up with, and will be happy to test and answer any questions you might have about the bicycle. I’ll also have Darren’s vast experience and expertise to refer to. 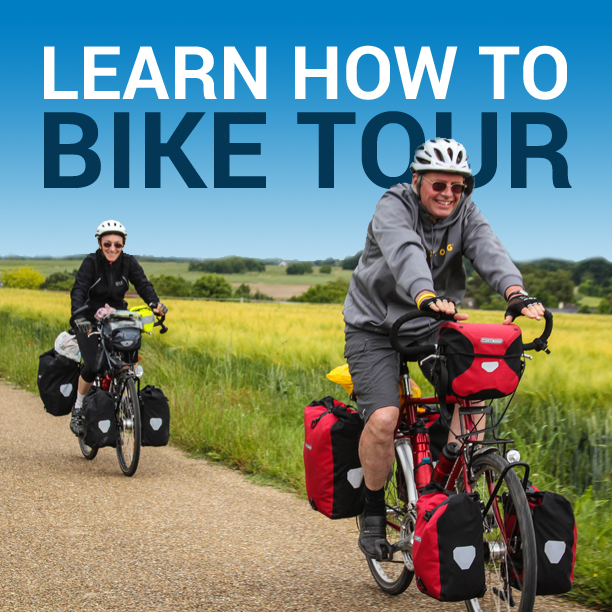 There will also be live “webinars” during the tour where you’ll be invited to watch us live from Portugal and Spain while submitting questions about our travels by bike and/or the Van Nicholas bicycle that I’ll be riding. Following the tour, I’ll write a comprehensive touring bike review for Van Nicholas that will be published here on the Bicycle Touring Pro website. After each tour, Darren also writes a long blog entry on his website where photos and videos from the tour will be shared. This is all going to be a lot of fun and I hope you’ll come along for the ride by following us on whatever media you tap into. If you’re in Portugal or Spain (or planning to be) and you want to ride with us this spring/summer, consider signing up for one or more of the five bike tours on this page. This entry was posted in Bicycle Touring Pro Articles, Bicycles, Featured Articles, Guest Posts, Main Articles, Product & Service Reviews, Products, Touring Bicycles, Website Announcements and tagged deveron, titanium bicycle, titanium touring bike, touring bicycle, touring bike, touring bike reviews, van nicholas, van nicholas deveron, van nicholas yukon, yukon. I look forward to hearing more about the van Nicholas Deveron. bicycle. How is the chain tensioned at the rear wheel? When will a disc brake model come out?